HOW FAST SUMMER DISAPPEARS AND WINTER ARRIVES! ﻿Yesterday I ran my usual Mansfield Loop, a 26 mile mountain adventure, only to find winter in full swing, not what I expected. With more than 3 hours of running/post holing in the snow on top of another 3+ hours of running in mud and water, I managed to get out of the woods just as the sun was setting. Good thing as I decided I didn't need my headlamp and didn't have enough food to go any longer as the bonk mode was already setting in. Oh well, just another training run. 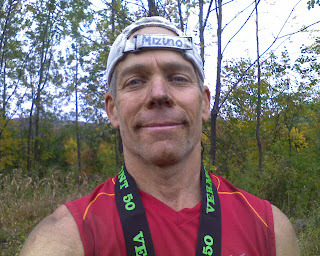 The Gear: I wore the Mizuno Cabrakan trail shoe which was great for the needed added traction for most of the terrain. At times I could have used the Mizuno Kaza spikes for the ice. For clothing I wore the Mizuno light weight tights along with the Mizuno techie wear for the top. But most imortantly was the Cabrakan light weight shell for the howling winds on the summit to keep my core warm as toast. I also wore a balaclava and hat too along with the Breathe Thermo gloves. USATF National Championship Masters 5K Team Race in Syracuse, NY. Myself, along with 4 others from the GMAA in VT made the trip to defend our title from last year. With speedster old guys, Norm Larson, Tony Bates, Kevin McMahon and Jim Miller, we made the drive over from Burlingto to Syracuse. The course was an out and back, fast, 5K road race, something I'm not usually found doing. Last year I nearly exploded at the finish after a way too fast first mile and a slow finish time. My goal this year was to run my own race and hopefully do better. The first mile I was 10 seconds slower than last year coming in this year at 5:28 instead of 5:18 and I figured out how to calculate kilometers as the rest of the course was in kilometers. Running still way to fast for my usual, I ended up 9 seconds faster than last year. So being a bit more conservative right from the start did make my time faster in the end. Hmmm, maybe there's something there. For the team, Jim had some issues which we knew could pop up but still he kept on going and with his incredible efforts, we placed second this year. Not bad for a bunch of old farts from VT. Even more impressive was our 60's team of Ted McKnight, Ed McSweeny and Chuck Arnold won placed first at this years event for their age group. Congrats to these guys! 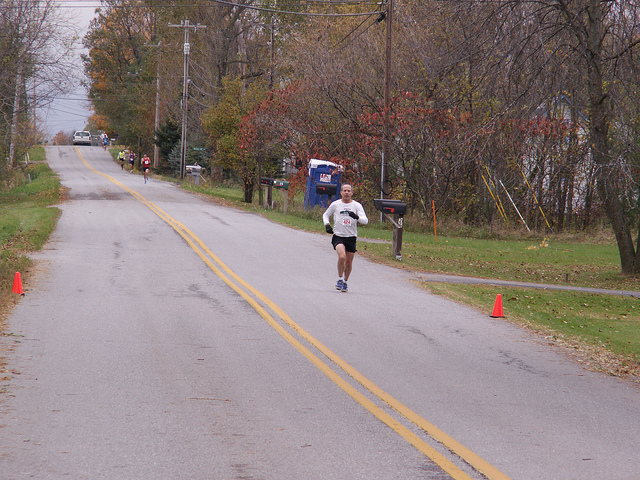 The Gear: For this short road race I wore the Mizuno Musha 2's racing flat. Super lightweight and fast. Maybe that's why I was faster than last year. After the race I ran around Syracuse and back to the hotel to make it a 20 mile day. For the pavement poundiing I ran in the Mizuno Alchemy for added support and cushion to make the hard surfaces a bit softer. The next weekend I opted out of any races but the following weekend ran the GREEN MOUNTAIN MARATHON in So. Hero, VT. This was the 40th annual running. I find this race a real challenge although it's mostly flat but run a lot on dirt roads and is an out and back. And there is always a wind either heading out or coming back. This year it was a headwind on the return trip. From the start and directly into the wind for the first mile, we had a crowd of about 6 of us running closely together. After mile 1, you make a 90 degree turn and the wind is at your back and for the rest of the first half, or most of it. Eli Enman quickly took the lead. Eli won the race last year. After a few miles, Binney Mitchell caught up to Eli and gave him a good challenge up til mile 18. 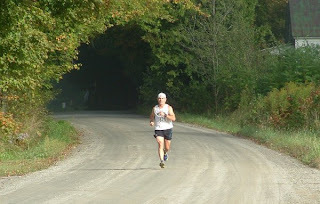 Binney had been training this year for a western 30K trail race so was mentally good for 30k. After that, he fell off a bit and Eli took control of the race. Myself, I ran the race as I usually do, in my own mode, however I can. I kept up running 6:15-6:20 per mile for the first half but on the way back was averaging more in the 6:45 range into the wind. In the end, I still ran my fastest GMM in the time of 2:51:55. I came in 6th overall and earned a star after my name for exceeding the USATF time standard for national ranking. Any when you look at the age grading which they now do for all the races, I placed first for whatever that means. Anyway it was a good trainer for JFK which was the intent. For the Gear: I ran in the Mizuno Musha 2's. This was the longest I have run in these lightweight racing flats and it was also my fastest GMM. Maybe there's something there?? 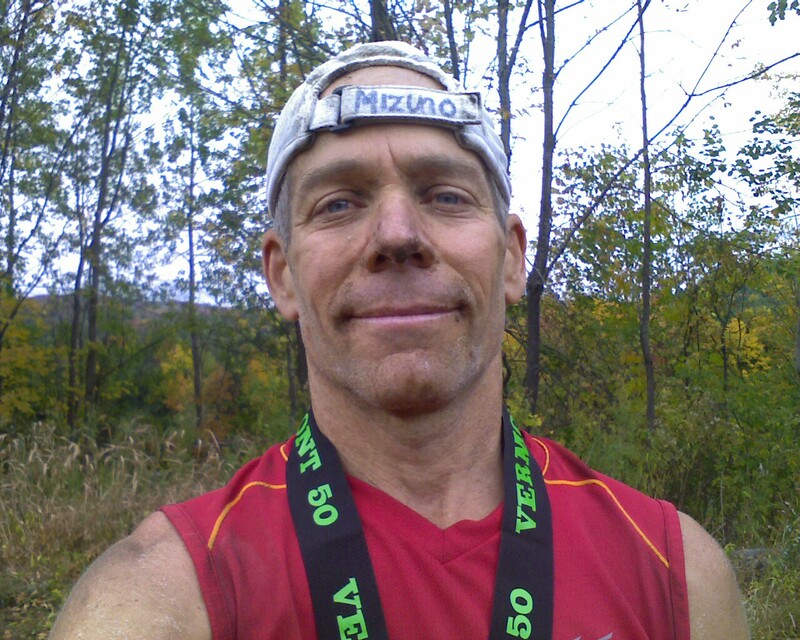 I also wore the Mizuno techi shorts and the Mizuno Breathe Thermo gloves as it was a bit chilly. Somehow in between training and races I managed to get to some of my best mental training. I like to head down to VT Skydiving in Addison, VT to jump out of airplanes at 12,000 ft. to relax. It's always a blast to play superman. The Gear: Infinity 170 chute, part of the rental fleet as I don't have my own yet. For footwear I chose an old pair of Mizuno Alchemy's for a good slide landing in the grass. So from a 50 miler at the VT 50 to a 5K road race to the Green Mtn. Marathon and jumping out of planes. Five days later was a special invite to the 8K XC race at St. Michael's Invitational at the College in Winooski, VT. The GMAA was invited to participate in a college race. For the men we had 11 runners and for the women, 6. In the end we placed 2nd for the men and also 2nd for the women up against 6 or 7 college teams. The only team that placed higher was the UVM team. It was fun running with the young college kids and I wonder what they were thinking as a bunch of old guys were running along side with them. It was a good trainer for our 50's team as we have the NE XC Championships coming up in 2 weeks in Boston and then the National 10K Club Nationals coming up in December in Charlotte, NC. And in between, I have the JFK 50 mile speed event on November 20th. The Gear: For this XC event it was the Mizuno Kasa spikes for added traction in the grass and also the Mizuno Breathe Thermo glove as the northwest winds had brought in some cooler air. Next up, the NE XC 8k at Franklin Park and then the JFK 50 miler on Nov. 20th. It was hard coming back to reality after spending time in the mountains of Colorado. Such impressive mountains that one could very easily get used to. Hmm, it would be nice. Anyway, after returning back to VT, I quickly returned to the race scene with four 5K races withing the first 8 days back. First was the Tuesday night trail race at Catamount with maybe 4 hours of sleep. Not good but still was nice to be on good single track trails. 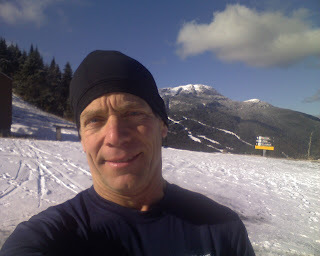 Next up was the Stowe Trail Series race behind the Golden Eagle Resort. One of the longest "5k" races I've been in this year. They used a GPS to measure the course which included multiple switch backs in the deep woods. Long but overall a fun course. Oh, yes I managed to get lost too even after a prerun of the course. Came back on the course and had to pass lots of folks to make more of a challenge. Still fun. Next day the GMAA Scholarship 5k XC run. A bit more accurate in the distance and always a fast run. 2 days later another Catamount 5K trail race. With each race, I felt more rested since Leadville and the times improved. On my return back from Leadville, I had promised to not run for a week. Well that didn't quite happen but I did take a step back and backed down on miles and also slowed down to enjoy my runs. No schedule, just running what and when I wanted to. Well sort of, as I know I have the JFK 50 in November and from what I hear it's a 50 mile speed event. Also there's the USATF National Masters Team 5K road race in Syracuse in Oct. and the USATF Team 10 National Championships in Charlotte, NC in December. So, speed is the focus. With that in mind, I ran the Archie Post 5 miler a week later. Always a fast start and first half leading to a gradual uphill to the finish. I wanted to keep it under 30 minutes which would be under 6 minute miles and did acomplish that with a time of 29:38 and won an awesome apple pie. Wore my Mizuno Wave Musha 2 racing flats. Awesome shoe! Next up, 6 days later, was the GMAA 30K Common to Common on the back rolling hills of Essex and Westford. Beautiful day for a run. Today's goal was to keep the run under a 6:30 pace. I went out from the start with Binney Mitchell. Binney has been running fantastic this year and after the first mile was gone. From then on, I ran my own race with no one else around. No one to really push me and no one to chase so I was on auto pilot, another trainer for JFK. I like these back road hills but there's one section on bigger hills where you really slow down but after that it's 4 miles of flat and gradual downhill to the finish. In the end I came in 2nd and was 10 minutes behind Binney and 5 minutes ahead of Todd. And I did achieve my goal with a 6:29 pace. I also broke the age group record by 8 minutes. And another day of running in the Mizuno Wave Musha 2's, the longest distance I've taken them so far. The back roads of Westford. The next week I surprisingly ended up at the VT 50 Mile Trail Race in Brownsville, VT. With other plans cancelled I managed to drive down to Ascutney on Saturday evening 15 minutes before registation closed at 8:00 PM. With no taper time this week, not sure how the energy levels will be. Soon we will know. Once I got myself registered and found some food, I drove up to meet up with Joe Carrara and Bill Kelner in the upper parking lot. There I set up Hotel Nissan and joined the boys outside for a pre-race ritual, a cold beer. Afterwards it was off to sleep for an early rise at 5:00 AM for a 6:25 AM start time. It probably got down to the 40's overnight, not too bad. It would be a chilly start but as always a fast start for the first 4 miles then, the uphills would start. I started out running along with Brian Rusiecki and Glen Redpath, 2 local eastern trail boys who I have gotten to know over the years. Brian has been running fantastic this year and 50 miles is a perfect distance for him. He's still working on the 100's. Glen helped me get up and over Hope Pass at Leadville 5 weeks earlier and ran in the Trans-Rockies that same weekend. As usual we went out way too fast, under 7 minute miles for the first 4 miles but then the pace slowed somewhat for the climbs to follow. We were running in a pack with about 10 of us. The single track in the woods was great and if anything, a bit too dry. We soon caught up to bikers who were also racing and on the downhills, they would go by us, kicking up a cloud of dust. The dry dirt was a very fine silt with soft piles on the trail. Running along with Brian, he was curious about a runner just ahead of us. He soon found out it was a serious contender and he put it into another gear and took off to catch this runner. That was the last I saw of Brian. From there on, I just kicked back and ran my own race. Brian was up ahead in a group of 3, Glen was just ahead of me with 2 others and I was bouncing back and forth from 5th to 10th. In most of these races, there are always some who drop out and others who die off in the last 10 miles. So doing my own thing, I just cruised along. I felt ok, not totally energized but was enjoying the run for the most part. I would pass bikers on the uphills and they would pass me on the downhills. Then, nearing mile 30, I stepped aside on a steep downhill to allow a biker to go by and tripped on something. Down I went, rolling down the hill in the soft silt. No major pain but it was like I had been tar and feathered, without the feathers. The soft silt stuck to my sweaty body like glue and wasn't going any where. My arms, back, hands, legs and face were covered. Not much I could do but continue on. Even my water bottle was covered so the first sip of water was mud and water. Somewhere around 30 miles, I was starting to tire. I felt nasea coming on and was a bit dizzy. It took a while to regroup and I had to focus on eating more which I did. 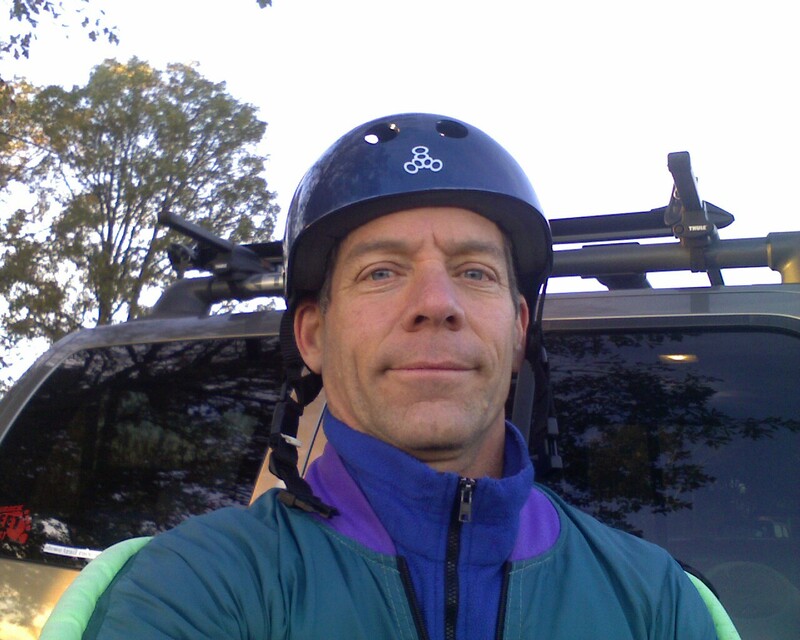 Somewhere around mile 37 or so on some fun single track I was feeling better. There's a house in the woods which you run just about under the porch. At this time I was running around 5th place. Some guy on the porch, when he found out I was running 50 miles said I needed counseling. Laughing as I went by I responded that this was my therapy. A couple of miles later, as I was passing a 5 K runner, I tripped and again was rolling in the silt to add to my collection of dirt. Onward ho. Just about that time another runner, Greg had passed me feeling strong but soon I caught back up to him as his quads had given out for the downhills. So he would pass me going up and I would pass him going down. I knew if this kept up, I would catch him in the end as the last 1 1/2 miles is a down hill to the finish. But by mile 45, there were some good downhills and never saw him again. For the last few miles up and down the mountain, it was a grind up but I knew the end was near. I wasn't sure where any of the other lead runners were either. As I came throught the finish I knew it wasn't one of my better runs here but not my worst. With a time of 7:13 I finished in 5th, and 1st in my age group. I was within 2 minutes of the 3rd and 4th place finishers. Brian finished 1st almost breaking the course record and Glen finished in 2nd. The Gear: For shoes, the Mizuno Cabrakan 2's were awesome as were the Mizuno shorts and shoes. Perfect for a day in the woods. Next up: The USATF National Masters 5K Team Road Race.